As a homeowner or renter, it feels great to handle a home improvement project with your own two hands. From hanging pictures to cleaning the gutters, being able to accomplish these tasks and save money is a real boon. But as the pros know, you risk injury even when doing the simplest DIY projects. A recent report from home-improvement site Porch reveals how DIYers most commonly injure themselves—and the tools most frequently responsible for those injuries. Researchers analyzed data from the National Electronic Injury Surveillance System, which collects statistics on injuries associated with consumer products from U.S. hospital emergency departments across the country. From that, they were able to see the home improvement tools responsible for the most injuries, thereby giving us the list of the most dangerous tools in America. And as alarming as it may sound, it’s highly likely you have at least one of these tools in your home right now. Below, a breakdown of these injurious implements, how likely you are to get hurt if you use them, and helpful tips to use them safely. We weren’t surprised to find that ladders top the list of most dangerous tools, with an estimated 193,815 injuries per year treated in hospital emergency rooms. Ladders are used in a wide variety of home improvement projects … although they seem rather simple to use. However, J.B. Sassano, president of home-repair franchise Mr. Handyman, says there are plenty of opportunities for ladder mishaps—like if the ladder is not placed on firm, level ground. A ladder that’s too short or simply placed too far from what’s needed can force the person using to overreach and lose their balance. “And some people use the top rung as a step—but you should never stop on the top,” Sassano warns. So what are your chances to going to the ER as the result of a ladder-related injury? The data says it’s about 1 in 1,680. And the parts of your body that are most likely to suffer harm from a ladder fall? Your head, torso, lower arms, and lower legs. 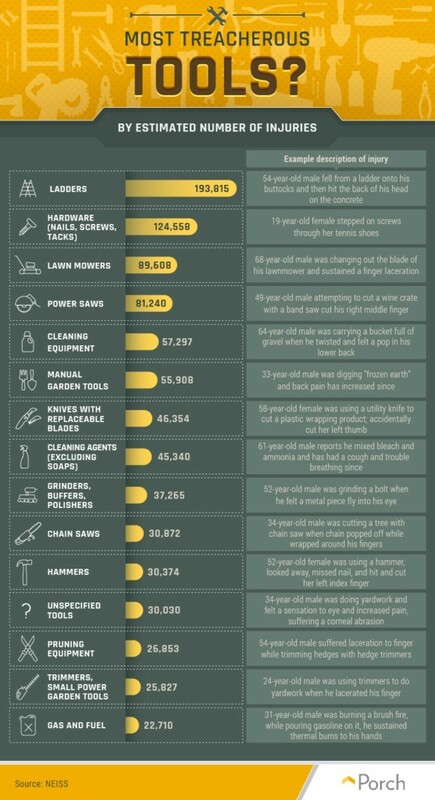 The estimated number of injuries by type of tool. Rounding out the top of the list of hazardous home improvement tools are hardware (which includes nails, screws, and tacks) with 124,558 estimated injuries; lawn mowers with 89,608 estimated injuries; power saws with 81,240 estimated injuries; and cleaning equipment with 57,297 estimated injuries. Although the odds of an emergency room visit decrease the further you get down the list, some of these injuries—like power saw injuries—tend to be more serious than others. “It’s not a call that we respond to very often, but the most gruesome tool accidents we see are from chainsaws. For example, someone is cutting down a tree and they end up cutting off or seriously injuring a hand, arm, leg, or foot,” says Battalion Chief Raymond Williams of the Birmingham Fire Department in Birmingham, AL. The likelihood that a power saw or chain saw will send you to the ER is about 1 in 4,009 and 1 in 10,550, respectively. The odds that a certain tool will send you to the ER. When are you likely to get injured? 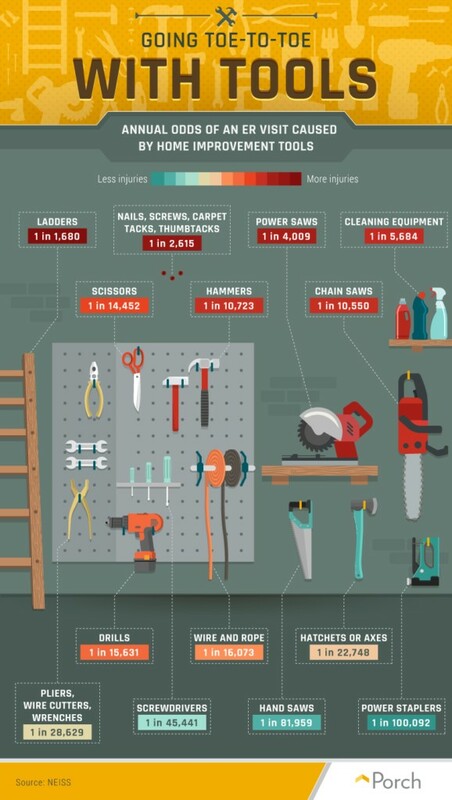 Homeowners can be injured by tools at any time, but incidents peak during the summer months, with the most tool-related ER visits occurring in June (an estimated 136,100 visits) and July (an estimated 137,400 visits). Injuries are down the most in January, with an estimated 79,800 ER visits. When we look at the number of DIY tool-related injuries by days, it probably comes as no surprise that most injuries happen on Saturdays. “One would expect the weekend to hold the highest number of injuries, which Saturday does, but Monday was the day with the next highest amount,” says Amanda Wooley, a spokesperson at Porch. Perhaps this is because several national holidays (like Labor Day and Memorial Day) are on Monday. The best way to keep yourself out of harm’s way when working with DIY tools is to use them the way they were intended to be used. If you don’t understand the proper operation, postpone your project until you do, or hire a professional. Regarding ladders, Sassano warns against using anything taller than a step ladder if you don’t have experience or confidence. “If you are a novice, afraid of heights, or do not own a ladder tall enough to safely clean your gutters, upper story windows, or check for roof damage, leave it to the professionals,” he says. The post America’s Most Dangerous Tools: Don’t Get Maimed in the Name of Home Improvement appeared first on Real Estate News & Insights | realtor.com®.